It's official: The federal government says Wheego can start selling cars here. The company says its California assembly center is working on the first 500 orders, and says there could be 70 Wheego dealers by year end. Wheego, the startup electric car brand that uses a Chinese body and U.S. components, is building its first 500 orders and expects to launch retail sales March 30. The Atlanta venture received U.S. regulatory approval at the end of December to begin selling a highway-safe two-seat LiFe model through 35 U.S. dealers. 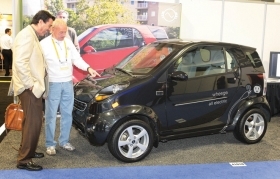 "We are ready to go," said Jeff Boyd, president of Wheego Electric Cars Inc.
Boyd said he could have 70 dealers by year end, and Wheego is exhibiting at the NADA convention to talk to prospective dealers. He said 24 potential dealers requested information on the franchise during the first morning of the convention. Boyd's pitch is that the franchise has no upfront investment requirements. It has no rules on store design or signs and no requirements on service tooling or parts inventories. Dealers must commit to ordering a specified number of vehicles, depending on their market potential, and must agree to provide mobile vehicle service, Boyd said. "Ninety-five percent of what could go wrong with this car can be fixed in the customer's driveway," Boyd claimed. Boyd said the company's assembly center in Ontario, Calif., will produce 200 cars a month for about 90 days and then ramp up volume as retail orders build. He said the operation has capacity to turn out 60,000 vehicles a year. The model runs on a lithium-iron battery pack made by California-based Flux Power Inc. that claims a 100-mile range. The car will retail for $33,995, including dealer delivery, before a $7,500 federal rebate.